Alternately: Clear (in the sense of “easily understood” rather than literally transparent); apparent; obvious. Able to be understood after a mere glance. Notes: It is also acceptable to write this as 一目了然. The meaning and pronunciation do not change, but a simpler character is substituted in for the relatively rare and complex 瞭. This compound comes from the 朱子語類 (in Japanese, shushigorui; in Chinese, apparently zhu ai yu le), a Confucian text from 1270 CE, compiled into 140 volumes. Ichi.moku.ryou.zen is from the 137th. 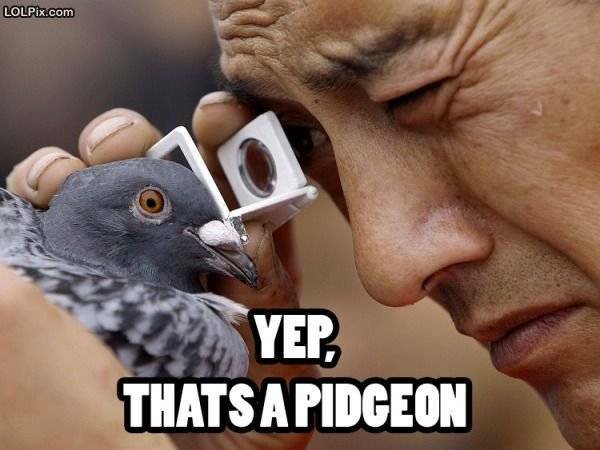 It turns out that “pidgeon” used to be a correct spelling, but yes, these days it should be “pigeon.” Either way, I find this picture amusing, and it’s appropriate to the post. This entry was posted in Japanese, Yojijukugo and tagged "at a glance", clear, 瞭然, obvious, 一目. Bookmark the permalink.